The Truth About Spray-Foam And How It Can Improve Your Insulation | Jerry's Insulating Co. The spray foam is known to expand to over 100 times its original volume. This means that you will not need such large amounts of spray foam even for a large surface area. A major consideration here is that the higher expansion rate for the material will give you a higher insulation capacity for a small volume of spray foam. Unlike the other insulation materials that barely expand, the spray foam will get into all the required spaces and effectively prevent heat losses in your home by creating a continuous air barrier in your walls. One of the primary reasons why spray foam insulation has superiority over fiberglass is because of its excellent air sealing properties. No matter how well fiberglass is installed, it does not provide the homeowner an air barrier that also allows air to flow through it. If this problem exists, conditioned air from the indoors and unconditioned air from the outdoors will combine and allow condensation to take place inside your walls. This will retain moisture in walls insulated with fiberglass and affect its service lifespan. In fact, insulation with fiberglass has a lifetime of 10 to 25 years if the walls stay dry while insulation with spray foam has a lifetime of more than 80 years as spray foam can stop air and moisture infiltration, unlike fiberglass. What’s more, spray foam insulation will provide high sound barrier efficiency while fiberglass insulation has low sound barrier efficiency. Spray foam as an insulation material expands significantly after installation. This means that you will be getting more density of insulation for a small unit of the spray. Once installed, the foam is also able to expand and contract along with the house. This means that unlike the other insulation materials that can crack or form gaps over time, this one is versatile and changes to suit the form of your house. This ensures longevity and lesser maintenance costs in the long run. 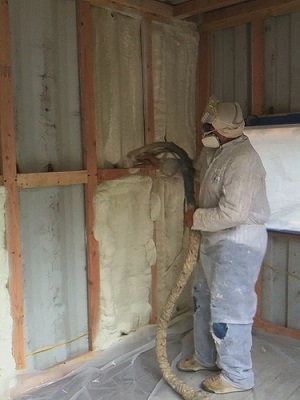 Spray foam insulation is much more effective than traditional insulation products such as fiberglass. What’s more, it helps to save more on energy costs and utility bills due to its effectiveness. Therefore, spray foam will usually cost 3 to 4 times more than traditional insulation products. Though the price might be perceived as one of spray foam insulation’s cons, always remember that you get what you pay for. The benefits you can gain with spray foam far exceed the price you are paying for it. In order to fully enjoy the benefits of quality spray foam insulation, this project must only be undertaken by certified installers. If you are looking to insulate your home, talk to us and learn more about using spray foam in Toronto. It is your safest bet for long lasting insulation!